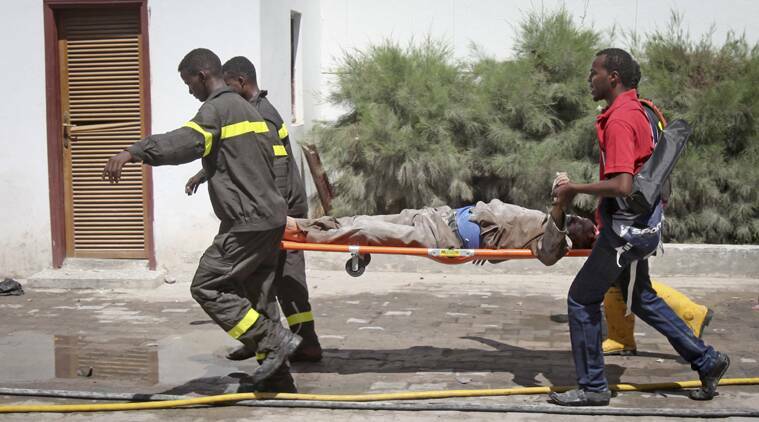 Rescuers carry away an injured civilian from the scene of a twin bombing attack on a hotel in the capital Mogadishu, Somalia. A video purported to be by Somalia’s al-Qaida-linked rebel group al-Shabab urged Muslims to attack shopping malls in the U.S., Canada, Britain and other Western countries. US authorities said there was “no credible” evidence suggesting a US mall attack was in the works. The masked narrator concluded by calling on Muslims to attack shopping malls, specifically naming the Mall of America in the Minneapolis suburb of Bloomington, as well as the West Edmonton Mall in Canada and the Westfield mall in Stratford, England.